Change comes, whether we like it or not. Abrupt or insidious, deliberate or accidental, joyous or tragic?life’s transitions are inevitable. In his new book In Transition, W. Wayne Price writes from his own experiences with painful change, helping us understand the issues that surround the most universal aspect of human existence. Price talks about the important phases of these transitions: asking why, letting go, forgiveness, memory, patient waiting, and more. He emphasizes the guidance that can be found in worship and in community. Always, he points us to the strengthening and deepening of spirituality that can result from working through the loss and bewilderment inherent in change. Price’s pointed and passionate writing conveys the deep emotion that accompanies common transitions?transitions such as a change in status, the loss of a relationship, or the death of a loved one. He frankly discusses his own personal encounters with change, sharing the insights he has gleaned throughout his own life and in his career as a parish minister. 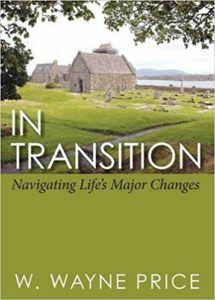 In Transition offers wonderful comfort for those who find themselves adrift on stormy seas of uncertainty. It is an invaluable resource for pastoral or grief counselors, as well as for individuals going through major transitions in their lives.